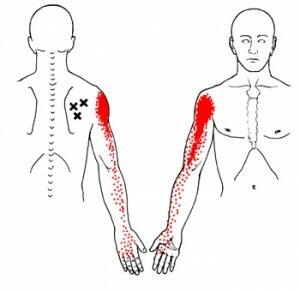 Is and injury to Rotator Cuff muscles that is normally caused by repetitive shoulder movements. Pain can be present when lifting arms overhead or behind your back or lying on the affected shoulder. Pain can also radiate into the arm. The suggested treatment involves different massage techniques to loosen and relax these muscles. Identified Trigger Points or Trigger Zones can be released by ischemic compression and DRY Needling. The Dry Needling is very effective in releasing tension in tight muscles as well as reducing pain. Muscle Energy Technique exercises and corrective exercises can be included into the treatment to lengthen and realign the affected shoulder muscles.